I agreed to take this book for review because, hey, I was feeling kind of Austen-like and felt in the mood to read a fun, fiction read. Per usual, I didn't look too deeply into the storyline before I started reading. I like to be surprised. Surprised I was, both in good and in bad ways. For starters, I thought the storyline was rather unique. Chloe Parker is a thirty-nine year old divorced mother who is obsessed with Jane Austen generally and Mr. Darcy, specifically. (For the record, I like Mr. Darcy as a character myself. But I am so sick of married and otherwise women obsessing over him. I like him but I'm not drooling, ok? I like my husband better. So there!) When given a chance to go to England and "live in Regency England" for a few weeks, she jumps on it. She arrives to participate in what she believes to be a documentary of sorts, wherein she expects to live the Regency lifestyle and talk a lot of Austen. She arrives to discover that what is really being produced is a themed reality show in which she is a participant, hoping to get Mr. Wrightman (our honorary Mr. Darcy for purposes of this book) to propose to her. The book drifts into a story about a single mother who is trying to win this reality show contest to get the guy to marry her and win $100,000 - which, of course, she is desperately in need of. Along the way her emotions are played and you, the reader, find yourself spending time with the best and worst of reality show contestants. The plus side of doing so in this case is that Doomebos throws in a lot of fun facts about Regency England and you learn a lot along the way. Otherwise, it's your typical romance novel. There is foul language in the book. There are "almost scenes." Given the fact that all of the characters in the book are supposed to be behaving as if they lived in 1812, the romantic scenes are always broken off for one reason or another. However, I could not in good conscious tell you that this book is clean as a whistle. It isn't. While Doornebos leaves the conclusions of certain potential scenes to the reader's imagination, she strings you along for more time than is necessary. I found this to be unfortunate, as the storyline itself was entertaining enough not to need to extra "stuff" to distract you. Reality shows are absurd enough as is to make the book funny. Jane Austen is romantic enough without attending to certain details. Anyway, the book was like a chick flick that makes the conservative watcher squirm at parts. This book is absolute chick lit and that is not my favorite genre by a long sea mile. I made an exception for it for Austen sake but I can't recommend it with enthusiasm. It has stuff in it I don't like to find in the books I read. It has stuff that I find highly unnecessary for story telling purposes. But if fluff is what you want, then the concept is diverting. Take it or leave it, as you so choose. 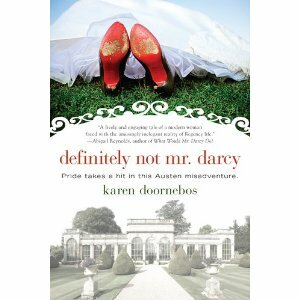 I received a copy of Definitely Not Mr. Darcy from Penguin Group USA in exchange for sharing my honest opinion. So there you have it! Sounds a little like Jane Austen Ruined My Life. It never occurred to me to obsess over Mr Darcy. That's... curious. Great review. I think I enjoyed it much more than I'd enjoy the book. I probably will pass on this but I love your review- so funny! For the record, I've never quite gotten what people see (and swoon over) in Mr. Darcy. He's a little too stiff for me. I always liked Mr. Knightly better in Emma. Sadly, this sounds like it might be a fun book except for the drawbacks you mention.